True orthodontic emergencies are very rare, but when they do occur, we are available to you. As a general rule, you should call the office when you experience severe pain or when you have a painful appliance problem that you can’t take care of yourself. We’ll be able to schedule an appointment to resolve the problem. You might be surprised to learn that you may be able to temporarily solve many problems yourself until you schedule an appointment with our office. When working with your appliances, you need to know the names of the parts of your appliances so you can identify what part is broken or out of place. After alleviating your discomfort, it is very important that you still call our office during working hours to evaluate if a repair appointment is needed. Allowing your appliance to remain damaged for an extended period of time may result to disruptions in your treatment plan. Braces are comprised of brackets or attachments that are bonded onto the tooth surface. 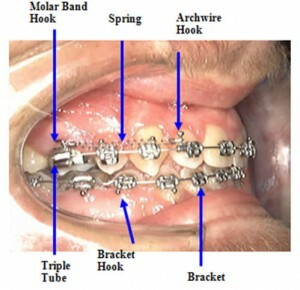 The molars may have bands or brackets. The braces may be bonded on the front of the tooth like most brackets, or bonded on the inside of the tooth like buttons, cleats, and turbos. 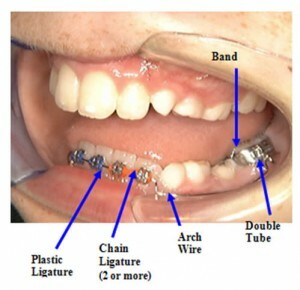 When bands are used, separators must be placed a week in advance to allow the bands or rings to fit in between the teeth. Braces on the outside of the teeth usually have wires running through them that move the teeth and are held in by metal ties (ligatures) or plastic ties (colored ties). The wires can be light and round, heavy and square, heat-activated or steel, straight or “Utility” with loops. There may be attachments on the wire like springs pushing or pulling the teeth or hooks for rubber bands. There may also be chains or ligatures joined to squeeze the teeth together. If one or more separators are lost two days before the appointment – do not call. If they are lost more than two days before, call us and we can determine if you need an appointment. When you get your braces on, you may feel general soreness in your mouth, and teeth may be tender to biting pressures for three to five days. Stick to a soft diet until your teeth do not hurt to chewing. Irritated gums and other sore spots can be relieved by rinsing your mouth with a warm salt-water mouthwash. Dissolve one teaspoonful of salt in eight ounces of warm water, and rinse your mouth vigorously. Placing Orabase on the affected area may also help relieve discomfort; Orabase can be found in a pharmacy. If the tenderness is severe, take Acetaminophen (Tylenol) or whatever you normally take for headache or similar pain. The lips, cheeks, and tongue may become irritated for one to two weeks as they learn a new posture and become accustomed to the surface of the braces. You can put wax on the braces to lessen this. We’ll show you how! Also, try to sleep on your back to avoid putting pressure on your lips and cheeks. Call during office hours and we will either schedule a repair appointment or fix it at your upcoming appointment depending on the location of the bracket and the proximity of your appointment. If the broken bracket is bothersome, place wax over it. Call the office during working hours to get the band re-cemented. Use the eraser side of a pencil to push the wire away from your lips or place wax on the offending area. Place wax on the end of the wire. Using a pair of tweezers or needle-nosed pliers, try to put your wire back into the last tube. If you cannot re-insert the wire, place wax on the end of it. If this does not provide comfort, as a last resort, use a small fingernail clipper or wire cutters to clip the wire behind the last tooth to which it is securely fastened. Sometimes discomfort is caused by not wearing the headgear and/or elastics as instructed by your orthodontist. Please refer to the instructions provided by your orthodontist. If the facebow (metal piece of headgear) is bent, please call our office for assistance. The headgear and/or elastics should hurt less the more they are worn, so be sure you get in the prescribed number of hours. Try to pull the wire or loop away from the gum with a finger (fingernail) or needle-nose pliers. If this doesn’t help, call the office to have the wire adjusted. Call during office hours to schedule an appointment to have them replaced. Bring the spring in with you. Watch for space opening between teeth. If you see none and your appointment is two weeks away or less there is no need to call. If you see space or your appointment is more than two week away, call for a time to have them replaced. Call during office hours to schedule an appointment to have the hooks and/or brackets replaced so proper and continuous rubber band wear can be resumed. If the wire stays in the bracket, nothing needs to be done. If the wire comes out of the bracket, try to place it back in with your fingers or needle-nose pliers. If the wire is out of the bracket and you can’t get it back in, call during working hours for an appointment to have it replaced. If the retainer is only broken on one side, leave the other side glued on. Wear your back-up clear retainer and call us during office hours to schedule a retainer repair appointment. If both sides of the retainer are broken, wear your back-up clear retainer. Place your retainer in a zip lock bag and bring it to your repair appointment. If you have a back-up clear retainer, wear that and call us during office hours to schedule an appointment. If the retainer is not fitting or broken, bring it to your appointment and we will see if we can adjust or repair it.